This isn't so much a post about two new burgers from Red Robin and Wendy's, as it is a post about PR, timing and entropy. As a former PR professional, I respect the PR game. I laugh at bad pitches like everyone else, but I do it with a twinge of sympathy. First, a disclaimer: I'm not a big PR score on any firm's list. My traffic, though targeted, is too low in volume to be worth anyone's real effort. Unless your product is a book about how to be a Jedi Ninja, my influence in anything is incremental, at best. So by pointing out that these two PR firms got a post out of me is more for case study value than to boast about how lucky these two firms were. Because, again, no one is going to buy a burger from this review. The ROI was zero. Calm your troll jets and read on. I received an email the other day from the firm representing Wendy's. They have this new "W" burger. I write about my life as a parent. Fast food has very little to do with my day to day life. I deleted the email. This is not a slam on the PR company at all. Their job is to pitch. Not all pitches hit their mark. It's part of the game. A few days later, I received a very interesting email about the name "Jim." It was chock full of facts about the name Jim, and it was sent only to bloggers named Jim. My name happens to be Jim, so this made me feel researched. To a blogger, nothing makes you feel as warm and fuzzy as being researched. Turns out the pitch was about Red Robin's new Jim Beam burger. Since I think bloggers have as much responsibility as PR firms for creating a pleasant PR/Blogger ecosystem, I felt it my responsibility to reward a well thought-out, creative, compelling, super-targeted pitch. I agreed to try the burger and post about it -- *head in shame* for a gift card. Oh, I forgot to mention that I was also in the middle of my Paleo diet (aka Caveman Diet - where you only eat what cavemen could hunt and gather, e.g. meats and vegetables, and avoid products of agriculture, such as starches, sugar and dairy). Any excuse to break that diet in the name of science. Bring it! A few days later, a follow-up email from the Wendy's rep arrived in my inbox. Because I had just agreed to do a Red Robin review, I thought that it might be interesting to review both burgers in one post, thereby making it more like a burger round-up than a "look what I posted in exchange for a gift card" kind of post. I emailed her back and agreed to review the Wendy's burger... *shielding body from barrage of a blogger beatdowns* for a gift card. Brilliant promotion, isn't it? Just so I could pimp this in good conscience, I had to try the burger first. I also made Fury try it, because he is a burger purist. He only eats burgers plain: with just the patty and the cheese, and no condiments or garnishes. If he liked it with all the accoutrements, that alone would make it post-worthy. They also sent me a pretty rockin' Jim Beam shirt. Disclosure, I wears it.BusyDad's opinion: I was skeptical at first because I hate burgers with barbecue sauce on them. While the Jim Beam burger is merely glazed with a Jim Beam glaze, and not drowned in sauce, it was along the same spectrum in my mind. I was wrong! The glaze gives the burger a sweet undertone without taking center stage. I love caramelized onions and swiss, so that was pretty much as expected: highly palatable. The garlic butter grilled brioche was a nice touch. I really thought it was added at the last minute to enable Red Robin's marketing copywriters to write something fancy in the description, but the crunch of the bun and the distinct garlic flavor that ensued really optimized my burger enjoying experience. In other words, I'd hit that again. Maybe on Dec. 6! Paleo be damned. Fury's opinion (transcribed word-for-word): I couldn't really tell the difference of the bun, but the onions added a really good flavor to it. It added a tangy sweetness to it. The Jim Beam sauce was pretty good, and I liked the way they had the swiss cheese. It seemed like the right kind of cheese for the burger. I would add another patty to make it a double [even though the single was still too big for him to finish in one sitting. Gluttony runs in the family]. I actually enjoy fast food (I ate my first Big Mac at the age of 5). I know it's not really a part of this nutritious breakfast, but neither is a Reese's Peanut Butter cup, so don't be vilifying, yo. 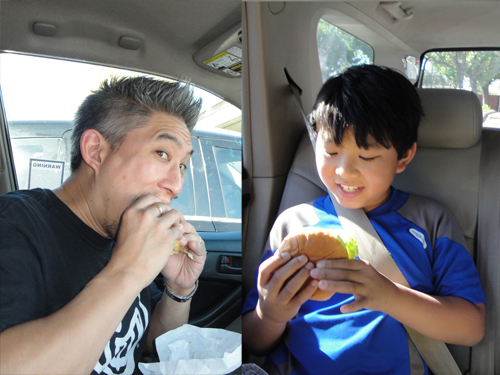 Last week, we went to lunch at Wendy's so Fury and I could try the new "W" Burger. Lisa had no issue with it (Frostys. She loves the Frostys - it is not spelled Frosties because Frosty is a proper noun. I'm not stupid), as long as we could do the drive-thru because once the baby is in her car seat and peacefully chillin, you don't rock the boat. So I found that juicy doubleBusyDad's opinion: the "W" is part of the "Dave's Hot 'N Juicy Cheeseburgers" line. This burger is marketed as a low-cost, but hefty burger, with two 2.25 oz fresh (never frozen of course) patties, two slices of cheese and special sauce. At $2.99, it had to be pretty weak in order for me not to give this a thumbs up. So I give it a thumbs up. It actually reminds me a lot of the iconic SoCal king of fast food burgers, the In 'n Out Double-Double. The sauce and construction are very similar. If you know burgers, to be even compared to a Double Double is an honor. So Wendy's can be very proud of their newest creation. Fury's opinion (transcribed word-for-word): When you bite it, the sauce leads you in. I took out the tomatoes because I don't really like them. I don't like onions either, but I kept them in there, and it actually added kind of a tangy flavor, which I wasn't expecting. I liked it more than the Jim Beam burger. And I liked how they made it a double [he finished this in one sitting].